One area of mathematics which I strongly suspect many students have problem understanding is place value. It is an important abstraction for students to understand, and without understanding it, it is unlikely that students will progress very far in arithmetic (and then will likely struggle in algebra later). Here is an activity my friend David Miles told me about years ago which I would very much like to see in action some time. Give the students a very large amount of beans (or something similarly small and dry) to count. For younger kids, give them a smaller amount, and for older kids, give them a larger amount. Start by asking them to estimate how many beans are in the bag. Perhaps ask them to give you a number which is probably more than the number of beans, and a number which is definitely less. It doesn’t really matter how good this estimate is, the idea is that by asking students to give an estimate, and then letting them compare their estimates later with their more accurate answers, that students may improve in estimating. 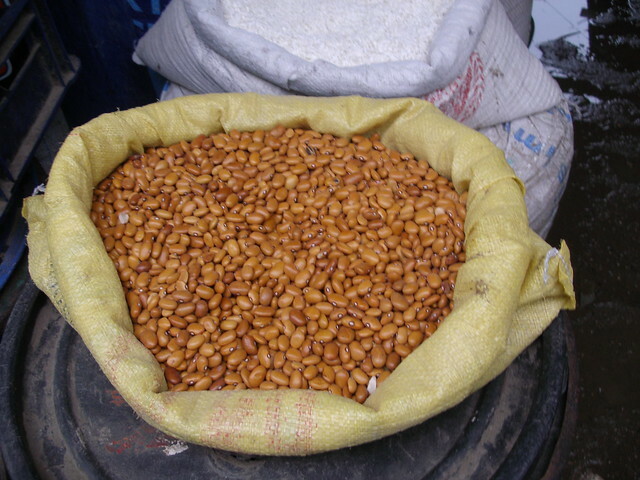 Next, ask students to work in groups to count the beans. Give them LOTS of time. Give them some very small cups they can use to help them with their counting which should ideally hold about 10 beans maximum. If you need to use larger cups, ask students to restrict themselves to only putting 10 beans in at a time. While kids are counting, if they aren’t keeping track somehow of their numbers, count loudly to distract them, forcing them to keep track of their results. Don’t give them any paper or pencil, just the cups. The idea is, the cups are too small to hold many beans each, and the students don’t have enough cups to hold all of the beans. What they will end up having to do is to choose one cup to represent ones, when this one fills up they will have to create another cup to put a bean in to represent 10 beans in the first cup, and when this cup fills up, they will have to create another cup to represent 10 beans in the 10-bean cup (or 1 bean represents 100 beans) and this leads to what place value is, at least for numbers greater than 1.